First let me address that "Me First" in the post title... The other day a grateful friend asked about how I made my sons' birthday "cake" - so I took her the directions. She then warned me that she would be posting photos on her blog and if I wanted to be "first" then I'd better get my act together and get the event posted. Mature of me, no? And now we'd like to bring you another delayed report - this time from mid January of this year. 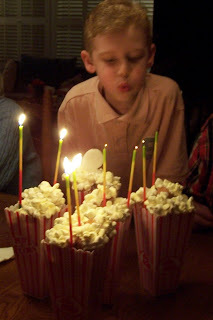 Jacob turned 9. (Try to ignore the fact that at this posting he's now 9 and nearly 1/3...) The goal is always to have Christmas decor put away by the time his birthday rolls around on the 19th, and we did fairly well with that - at least having all the trees and decorations down, boxes and bins packed and some if not most of them out in the storage building again. Giving it a quick thumb through I decided for $10 it was worth it. It's stuffed with great ideas! The tip of spooning all of your cake batter into one large ziploc, cutting off a small bit of the corner and squeezing the batter into those mini cupcake pans rather than trying to fill them "2/3 full" with a spoon and slobbery index finger was worth the MSRP. 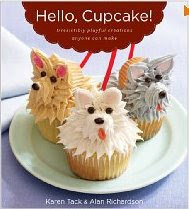 The entire book is that way - telling you, with detailed and luscious step-by-step photography, how to create an array of impressive mini cakes with simple tools you already have (remember those ziplocs?) ingredients like canned frosting, spiffed up cake mixes, packaged cookies and candies you can usually find at a gas station convenience store. Yes, well worth the purchase. Anyway - after pouring over the book for an hour on the drive home, Jacob settled on the "Popcorn" cupcakes (made with mini yellow and white marshmallows, canned frosting and popcorn containers both borrowed from a friend - which is probably how this "me first" thing started - and purchased at the Target Dollar Spot long ago) and a "Movie Night" theme was born. He picked a movie to be shown (Chronicles of Narnia - Prince Caspian,) we made a favorite dinner, (veggie cheeseburgers with the works and tater tots,) whipped up some Popcorn cupcakes, (with about 200 pieces of "popcorn" made from mini marshmallows) and assembled a collection of movie candies of both the "regular" and "sugar free" variety for all his guests. 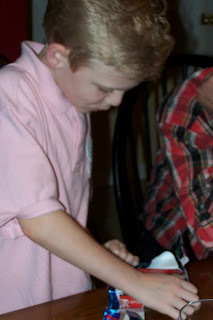 It was a very casual evening - opening gifts around the dinning room table with his four grandparents, mom and dad and brother and sister. 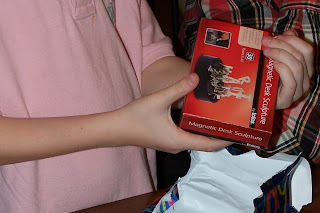 Aside from the usual "Webkinz" (that he seems to receive at any time he receives a gift) and some new family games for game night, his most favorite gift was this little magnetic letter "thing" that I picked up for a buck and a quarter at Wal-Mart in the after Christmas clearance aisle. It was one of those things from the "I-have-no-idea-what-to-give-my-dad-without-spending-any-significant-money" bin. And at 75% off, if was quite affordable. I wish I'd bought a dozen of them now instead of spending all that other guilt money. You know what guilt money is, right? 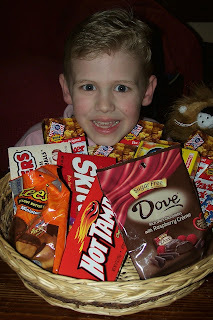 It's when you spend a lot on stuff for a kid who has a birthday a few weeks post Christmas - trying to convince them that you just didn't hold back some of their Christmas gifts to save a little dough... The upside of that is you can buy stuff on clearance! Well - I'm sure there's more to say... but I'm up against the "me first" clock now and have to hit the publish button. 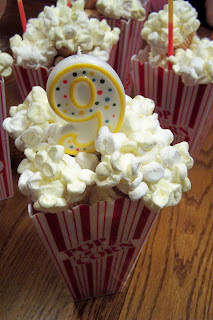 The popcorn cakes are adorable. I'm glad you beat your friend to the post. I think the that cake will never be forgotten..kudos to you! These are the cutest things ever. They are tons cuter than Grateful's. LOL! I thought I commented on this already? But I got a message from Blogger awhile back saying some comments had deleted from many blogs... maybe you were a victim. This was so clever and awesome looking! Way to go. I got on here to ask if I need to do some other kind of party like you to get you to post again?! OK, so I had to come back to this post. This post made me run out (Amazon.com) and get this book right away. My kids were amazed at it.